Titan challenges the definition of pro-style hoods with its impressive size, powerful blower, and stunning good looks. Featuring Zephyr's new PowerWave™ technology, Titan features a 750 CFM blower with the option to combine two blowers together to achieve 1,300 CFM. Its unique aerodynamic blades improve efficiency with unparalleled quiet operation. The ultimate workhorse in the kitchen, Titan is available up to 60-inches and features pro baffle filters and LED lighting. Since 1997 Zephyr has partnered with noted international industrial designers to create unique collections of kitchen range hoods: the timeless Cheng Collection; the sleek modernist Arc Collection; and the high-style high-performance Essentials line. 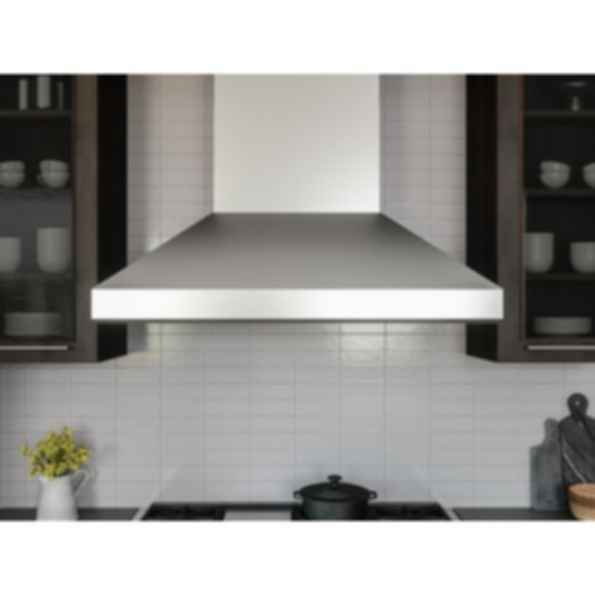 Based in San Francisco CA Zephyr designs manufactures and distributes performance based design-forward range hoods to match today's diverse kitchen styles. Viewing every object in the home as an opportunity for self-expression Zephyr creates design-forward high-quality elements that take professional designers builders and consumers beyond the usual options to discover new aesthetic and functional possibilities in kitchen design. Zephyr is at the forefront of an industry movement which enables customers to create home environments that reflect their unique tastes and lifestyles. Specialties Zephyr designs manufactures and distributes high-end kitchen ventilation products.